I was reading about the Ningen in Japan, and I have a question. Maybe these stories about these beings are real and Ningen are beings for another dimension or another planet living recently on Earth, or maybe they had a purpose in the next polar shift and the aftermath. [and from another] http://www.unexplained-mysteries.com/forum/index.php?showtopic=110926 It’s allegedly a very large unknown animal sighted by Japanese fishers, which bares an uncanny resemblance to us. Not only a face, but other reports include even arms and hands. One could speculate that a sea creature, even a known one, could be mistaken for a “Ningen”. Skates and rays, for instance, have nostrils and mouths that look like a face. In fact, they look so “human” that they are often mistaken or sold as devils or extraterrestrials — and Japanese fishers know that for centuries. But the Ningen is allegedly 20 to 30 meters in length. [and from another] http://pinktentacle.com/2010/01/ningen-humanoid-sea-creatures-of-the-antarctic/ Over the past few years, rumors have circulated in Japan about the existence of gigantic humanoid life-forms inhabiting the icy waters of the Antarctic. Reportedly observed on multiple occasions by crew members of government-operated "whale research" ships, these so-called "Ningen" (lit. "humans") are said to be completely white in color with an estimated length of 20 to 30 meters. Eyewitnesses describe them as having a human-like shape, often with legs, arms, and even five-fingered hands. Sometimes they are described as having fins or a large mermaid-like tail instead of legs. The only visible facial features are the eyes and mouth. The evolution of life on Earth, as on other life bearing planets, followed a path that looks like a tree, species branching off from a common genetic background. Both fish and humans have legs and arms, though on fish these are called fins. In seals, flippers. And in snakes and eels these genes do not express at all. The human infant goes through stages in which it has gills for breathing, and a long tail. As can be seen in the skeletons of sea cows, the flippers not only look like arms, the hands even have fingers. 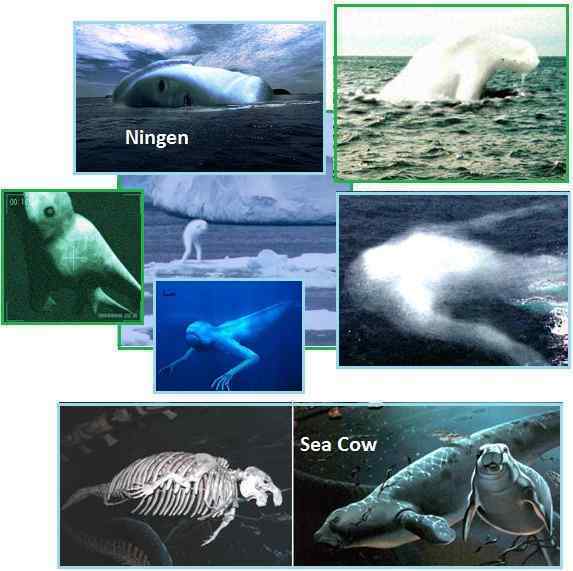 The Ningen is merely a rare whale where the flippers or fins remained or became distended for agility on the ice. Whales are land creatures that returned to the water, and thus originally had agility on the land. A question to the Zetas! I was reading through a thread on where they6 talk about something called "Chevron Deposits". From the links I read, and some other stuff that came up on Google, along with the photo's and Google Earth material - it's obvious water sloshed over the land masses. 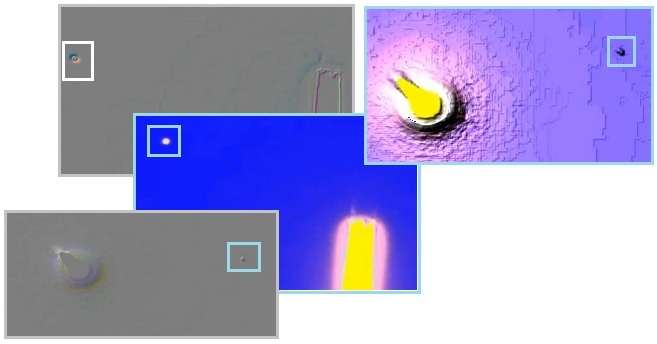 Are these Chevron deposits due to the last passage of Planet X? Are the 'older' ones, covered in vegetation, evidence of even older shifts? [and from another] http://www.nytimes.com/2006/11/14/science/14WAVE.html?_r=3&pagewanted=all Scores of such sites have turned up in Australia, Africa, Europe and the United States, including the Hudson River Valley and Long Island. The chevrons all point in the same direction to open water. Half the myths talk of a torrential downpour. A third talk of a tsunami. Worldwide they describe hurricane force winds and darkness during the storm. [and from another] http://www.earthmagazine.org/article/giant-dunes-not-mega-tsunami-deposits About four years ago, a group of scientists proposed that a series of giant, wedge-shaped sandy deposits found along the shores of southern Madagascar might be evidence of a giant tsunami — a “mega-tsunami” — generated by an asteroid that may have blasted into the Indian Ocean sometime in the last 10,000 years. As a tsunami approaches the shore, the wave becomes more or less parallel to the shoreline and it will wash straight in, she says. But the Madagascar dunes formed at a high angle to the shore. Chevrons formed from ocean deposits along coastlines are yet another absolute proof that the Earth has experienced regular crustal shifts in her recent past. The pattern in the Chevrons is from the sloshing in the oceans we have predicted - high force, single direction, and height. The Madagascar Chevrons show the angle of assault clearly. In every case, the angle of assault in such Chevrons is from an ocean body, straight in toward land. Scientists who refuse to consider that periodic Pole Shifts happen to Earth struggle to explain them. The angle of assault does not match computer models for tsunami assaults. Evidence for a comet impact, where the waves would be high enough to deposit large amounts of sediment from the ocean floor, is missing. It is only the large tidal waves we have predicted and described, where the entire ocean is on the move, that such sediment can be swept inland. The tides during the Pole Shift will rise 500-600 feet along coastlines, not crashing down but steadily pushing inland. 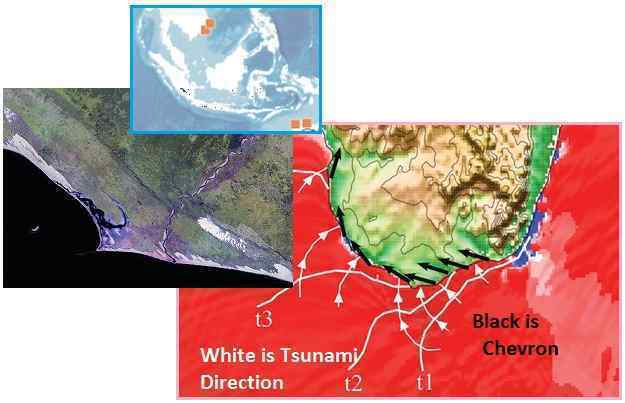 Why are the formerly prevalent theories just now being challenged - that these coastal Chevrons were caused millions of years ago or were formed by tsunami from comets? Scientists aware of ZetaTalk and the presence of Planet X are taking our warnings seriously, and looking for evidence with which to educate the public. My question this week pertains to the killing in Wisconsin today. Would the Zetas care to comment? The phrase "domestic terrorism" is unnerving, and the words false flag have already begun being tossed around, but ZetaTalk is really the only trusted true source. And any comment on the push for gun control/ammo manufacturing? [and from another] http://www.reuters.com/article/2012/08/06/us-usa-wisconsin-shooting-idUSBRE8740FP20120806 A gunman killed six people and critically wounded three at a Sikh temple during Sunday services before police shot him dead in an attack that authorities are treating as an act of domestic terrorism. [and from another] Sikh Temple Shooter Named as Army Vet Wade Michael Page http://gma.yahoo.com/sikh-temple-shooter-identified-army-vet-wade-michael-121406665--abc-news-topstories.html While in the Army Wade served as a sergeant, and later as a specialist based in Ft. Bliss in Texas and at Ft. Bragg in North Carolina. Wade's job was as a Hawk missile system repairman, and he then became a psychological operations specialist, defense official confirmed to ABC news. [and from another] http://news.yahoo.com/wade-michael-page-identified-wisconsin-temple-shooter-121406558--abc-news-topstories.html Page, 40, served in the Army from April 1992 through October 1998. He was separated from the Army with a less than honorable discharge and had been demoted from sergeant to specialist during his service. 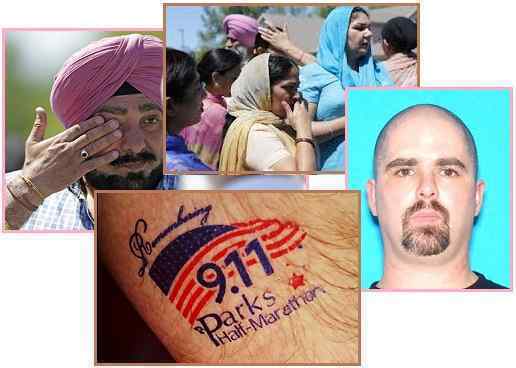 [and from another] http://www.globalpost.com/dispatch/news/regions/americas/united-states/120806/wade-michael-page-identified-sikh-temple-shootin Page was reportedly a skinhead with a 9/11 tattoo. Page had only lived in the apartment for about a week, and had just broken up with his girlfriend. Why would a White Supremacist attack Sikhs on their day of worship, in their temple, so viciously. It was noted he attacked males in particular, as though making a message against their signature colorful headwrap and long beards and hair. White Supremacists are stating, by their stance, that they blame all but white for everything that is going wrong with their lives and with their world. Were it not for the others, everything would be rosy. Affirmative action would not be taking their jobs. Population explosions in developing countries would not be taking all the food. If they have miserable lives, it is never their fault, it is the fault of the others. Page had worn out his welcome with the Army, who demoted and expelled him, taking away the welcome mat in the process. Though he was a sergeant in the Army, his current job was menial, a working class job. His girl friend had recently broken up with him, forcing him to move out. At 40 years of age, the age of mid-life crisis, he had nothing to show for a life of fuming anger, blaming others. The Sikhs came to his attention because of their showy headgear and dress, like a red flag waving in his face. They were also successful in life, where he was not. His anger boiled over into anger, something which had gotten him in trouble repeatedly but he had always managed to escape serious repercussions. Did he expect to walk away from his rampage? Yes. Arrogant and over confident, he expected to walk away. He had played the Army and confronted the police on occasion, and escaped. Were it not for a quick response from the officer who shot him, he would have faded away, or so he thought. He chose his victims carefully, as the Sikh are nonviolent, and he did not anticipate a defense. Only grief and a rush to help the injured, while he escaped. Just minutes ago the news has announced a successful landing of NASA's Curiosity Rover on Mars. Is this a fake news used by NASA to attract more investment? I thought all attempts trying to land on Mars are banned by the World of Council as there are already Annunaki doing gold mining on Mars. 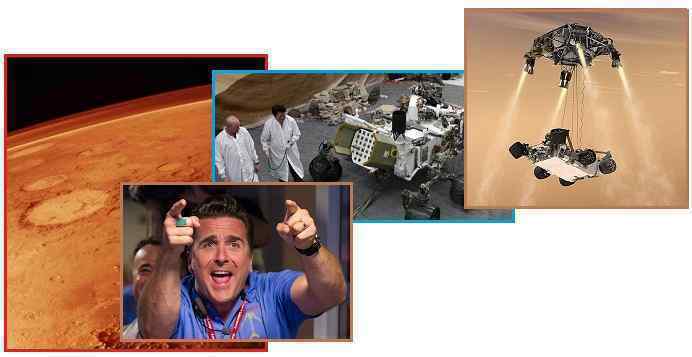 [and from another] Would a legitimate landing on Mars be part of an unfolding disclosure? Though the Council of Worlds imposed a quarantine in the past to keep mankind and the Annunaki apart, this quarantine did not preclude mankind’s exploration of Mars nor the discovery of the Annunki’s presence in the past. There is evidence of the Annunaki on Earth, in abundance, and this is not hidden. We mentioned recently that the elite are still interested in going to Mars to escape the Pole Shift chaos on Earth, but for this they would need the assistance of aliens in the Service-to-Self, and the Council of Worlds would never allow this. We also mentioned recently that the elite are interested in having NASA put forth the taxpayer funds and personnel to prove that the trip would be safe, and are not beyond hinting at life on Mars in the past to peak curiosity in the public. Beyond trying to inspire taxpayer curiosity, so funding will not be withdrawn, the Curiosity rover has a mission not unlike past missions. Will this rover suddenly discover evidence of past life on Mars? That is almost a given, since the elite realize that without avid public interest additional funding for NASA ventures would not occur. Methane gas, which is evidence of bacteria and plant life in the past, will be admitted, though it has been uncovered during past exploration. Glimpses of structures that imply hominoid visitors in the past may also be allowed, and certainly the abundance of water underground on Mars will be confirmed. All to force Obama to provide continuing funding! What happens in regards to Earth changes after the coverup breaks? Prior ZT has said that though events have been buffered by the alien boxes along faultlines, that the overall timeline for the Pole Shift will not be delayed. Prior ZT has also said that the New Madrid adjustment should have already occurred, and since the Euro-tsunami was to occur directly after that, I assume that the entire 7/10 should have completed by now. So after the coverup breaks, and that battle is over, then how will that affect the plate movements held back by the boxes? Will we get specific details from aliens on what is coming and when, similar to the recent Mexico EQ during a planned drill? It seems counter-productive to break the coverup and then have mass death as events "catch up". Nancy has always been aware, and has always stated as her opinion, that the 8 of 10 phase would be a long phase. It is clear from our ZetaTalk on the 8 of 10 phase that planetary clash between the Earth and Planet X and perhaps with Venus and the Dark Twin would increase. Plate movement in some areas would become continuous, and our predicted explosions in the oil fields of Iraq would result due to these plate movements. Treaties would be broken and a separation of peoples into those in denial and those determined to survive would occur. Riots and rebellion would be on the increase. Blending of the seasons would become the norm. And visibility of Planet X and its components would occur along with a more severe wobble. By slowing the pace of the 7 of 10 while going to war with the cover-up, the Council of Worlds is putting an awareness of what is coming, the pending Pole Shift, before the great death that would otherwise arise from the 7 of 10 changes left unfettered. The European tsunami alone would have killed millions, drown before they could even become aware of the ZetaTalk message or aware of the near presence of Planet X looming ever closer. They may die still, but their drowning will be a choice by themselves or other humans blocking an escape or failing to assist. These are the spiritual lessons to be learned, in this mankind’s schoolhouse – planet Earth. We have predicted that an announcement by the establishment, principally by Obama and NASA, will be made, admitting the near presence of Planet X but going no further in their admissions. The alien presence will not be admitted, nor the severity of the pending Pole Shift. This announcement is in the hands of man, and may still abort, but even if it occurs the Council of Worlds would not simply release the tension in the plates so that the 7 of 10 would rush to its conclusion, suddenly. The announcement cannot wait because the Council of Worlds has pressed the establishment to the brink, where the public will be aware, with or without their announcement. But whether the public becomes aware via an announcement or not, there is a space of time the public deserves to come to personal decisions and take action. Two communication satellites are now lost in space after a Russian rocket failed to place them into orbit on Monday. Experts admit they now pose a threat to other satellites and potentially the International Space Station, Plus footage of UFOs seen during the launch, could the zetas comment on this mission failure and the excuse of danger to other spacecraft? [and from another] http://www.nytimes.com/2012/08/08/world/europe/russian-booster-rocket-fails-to-deliver-satellites.html The satellites, worth about $45 million, were intended to provide telecommunications services for Indonesian and Russian customers. They were carried by a Proton rocket, with a Briz-M booster, launched from Russia’s Baikonur space center in Kazakhstan. During the launching, the Briz-M booster activated as scheduled but switched off after only seven seconds instead of the more than 18 minutes needed to propel the satellites into the proper orbit. One of the lost satellites, called the Telekom-3, was the first Russian-made satellite bought by Indonesia. In May, a Russian-made Sukhoi Superjet 100 airliner crashed in Indonesia during a demonstration flight for potential buyers. Why would Russian satellites be taken out before they reached their orbit while NASA’s Mars rover Curiosity be allowed to land on Mars? The answer lies in the resulting benefit to the common man, vs a vs the elite. There are many agendas behind the Mars rover, but the only one that will come to fruition will be to announce the discovery of life on Mars. Methane from rotting organic material, bacteria and mold, and perhaps even living worms in the soil. The elite are trying to force Obama to get the US taxpayers to pay for manned missions to Mars, and this will hardly work given the current state of the economy and the pace of the Earth changes. But the Awakening to the alien presence will be facilitated. Russia was recently smacked by the Council of Worlds for trying to probe Phobos, a moon of Mars where the Annunaki have been mining for gold. The Annunaki and mankind are quarantined from contact with one another, and the Russian’s know this. The Telekom-3 communication satellite that was disabled was hardly designed to facilitate communications, it was intended to spy on desperate and drowning migrants heading toward Russian territory, the better for Russia to disable them. What is in the minds of man, the intent, is known to ourselves and other benign aliens. The very obvious UFOs involved in disabling these spy satellites were a clear message to the Russians.